» How Do YOU Set YOUR rates? The “Value Paradox”. ​Quick post on a COMPLEX issue that confuses so many practitioners when it comes to how to charge for services. When determining your rates, you want to take into consideration all the service components you provide, such as single sessions, programs, mini treatments, and the rest. To come up with an appropriate fee structure, you must FIRST identify the results your clients and patients get through working with you. Do they have less pain? If so, by how much? How can you quantify it? Can they enjoy actitivites now that they could not do in the past before your therapy? Do they need less medication, or other types of therapy? Can they do their job better / longer / more efficiently so they make more money? All these examples above are simple situations that we can help our clients achieve through the proper therapy. They have life-changing impact for the client! Don't underestimate the powerful changes you can facilitate... THOSE HAVE VALUE. 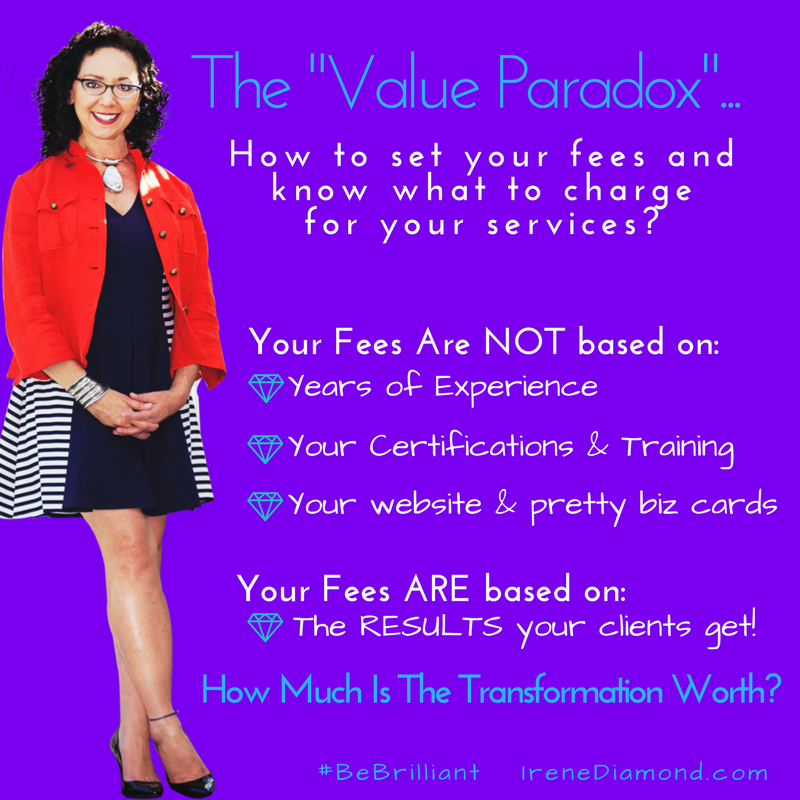 ​DO ​NOT set your fees on all the variables that have nothing to do with their outcome! Often, therapists think the time they spent learning a new modality, or their college education, or the number of years they've been in practice should reflect how much (or how little) they can/should charge. In reality, no-one really cares about those things like who your guru instructor was! Even , if ​you're new to the ​massage, physical therapy, chiropractic, acupuncture, fitness profession, if you can impact your clients in a measureable way, your fees should reflect that. Your clients ​ONLY goal is to get the EXACT RESULTS they want from working with you. If you can provide a solution to th​eir PRECISE need, you can charge almost as much as you want! My fees in my San Francisco clinic are much higher than most doctors, lawyers, physical therapists and chiropractors in this city. Why can I charge so much? Because I deliver the EXACT, SPECIFIC, PRECISE results my clients and patient (& referring health-care providers) ask for. I give them brilliant results for their orthopedic concerns, migraines and chronic pain through Active Myofascial Therapy! You can do the same thing -- if and when YOU CAN DELIVER SOLID RESULTS FOR YOUR CLIENTS & PATIENTS, TOO! ​If not, then you know what you need to do, right? ​If yes, then...what will your rates be now that you've read this blog? When I work with my high-level Dream Practice Mastery Academy members, we create and define their 6 Pillars of Service Offerings, and fine-tune the rates to be charged for each service pillar. ​Understanding how all 6 pillars fit together assures ​no confusion and everything fits seamlessly together. Rates for services vary from practitioner to practitioner, from state to state, across countries, and based on many variables. Be sure YOU are setting your fees based on RESULTS & VALUE... NOT on the time you spend with them nor how much training & experience you have. If I came to you with a killer migraine, I would happily pay you MORE to relieve it in 15-minutes, than have you tell me it will take an hour! This blog post is a simple discussion to support you in your choice of rates and fees. Post below how you came up with your rates/fees. If you need/want help on how to change that, ask questions. I'm here to support you -- what do you need? If you want help with setting your rates or any other aspects of your private practice, feel free to reach out! I also did the same as Kathy – and I was told to ring a few local therapists to see what they charged, but now I see the logic in your pricing ways when you get an inquiring person on the phone asking ” What are your prices ” there is no one for all answer, it all depends on the clients outcome of the therapy – I am now going to use this new way of approach to the pricing – Thanks You Irene, a (Diamond) lesson learned .- all the way from the UK, keep the good ideas rolling. You did it the same way most of us did it — figure out our expenses, add a little on top for our ‘salary’ and then secretly hope people will be able to afford us. Sometimes we are so afraid, we even drop the rate more! But once we learn the precise way to set our fees, we realize an outcome based practice really is the way to go! Basically, I considered/ projected the expenses of running my business from rent to utilities to communications of various kinds (Internet, phone, marketing) and then planned out my rates accordingly. That was when I worked for time not for the value of the results my clients received. Outcome based practice is the way to go!